Feeding the mosquitoes at the race start! I’ve finally gotten round to writing my account of the GNW100s 2010. And it’s only a couple of months late! Thanks to everyone who’s asked and waited so patiently, I hope this will inspire you to sign up for what’s touted as “The toughest trail race in Australia”. GNW home page. Sorry about how long it is, but there’s no quick way to report on a 35 hour event! Signing up was a challenge in itself. Registrations opened at 6am (Australia time) a couple of months out from the event. Being ‘kiasu’ organized, I drafted my email application, set my alarm for 3.45am (Singapore time), and waited. At 4.01am, I pressed ‘send’. Then, worried I’d sent it too early, I pressed ‘send’ again at 4.05am and hoped for the best. Okay, that was ‘kiasu’*. *kiasu means ‘afraid to lose out’. Its actual usage implies a meaning more like “dog in a manger“. Examples of kiasu behaviour includes accumulating too much food on one’s plate during a buffet lunch in case there is no more later, or emailing a race application twice in case the first one didn’t go through. A lot was riding on my entry approval. The aim was to get enough points to enter the 2011 Ultra Trail Du Mont Blanc (UTMB). Completing the GNW within the cut-off times would put 4 points towards my cause. I’d already earned 2 points in the 2009 Endurancelife Classic Quarter and the GNW was the only suitable race left within the time frame I had. It turns out I was right to be so kiasu about my entry … the 105 slots available were quickly filled and a waiting list formed within hours of registration opening! The GNW signage at Teralba train station. I arrived in Sydney a couple of days out from the race and travelled to Teralba by train. I stayed at Pippi’s at the Point. It’s a few minutes drive from the race start and right by Lake Macquarie. 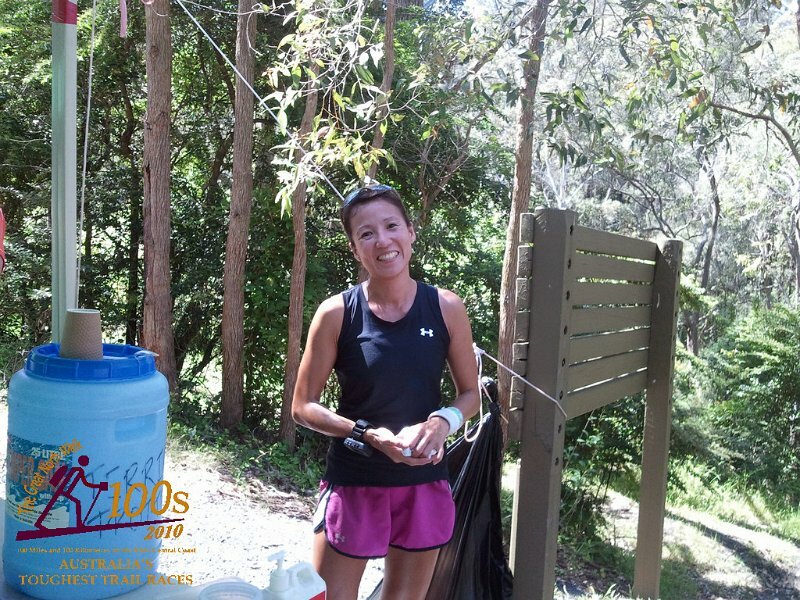 The logistics of doing a 100 mile event overseas without a support crew is an ultramarathon undertaking in itself, and I had list upon list of calorie calculations, packing checklists and travel itineraries to busy myself with. There are 6 checkpoints along the race route, and you are allowed to leave dropbags with extra supplies at each one. I bought small, insulated cool bags from a local store and used them as dropbags. I ran through the event in my head, working out what I thought I’d need at each stop, adding a little extra (kiasu again!) and making sure I fulfilled the mandatory requirements for items such as hi-vis vests and headlamps. Got a lift to the race start at Teralba with Luke and his family. He was doing the 100km event and stayed at Pippi’s the night before. Such lovely people, very friendly and helpful beyond words. 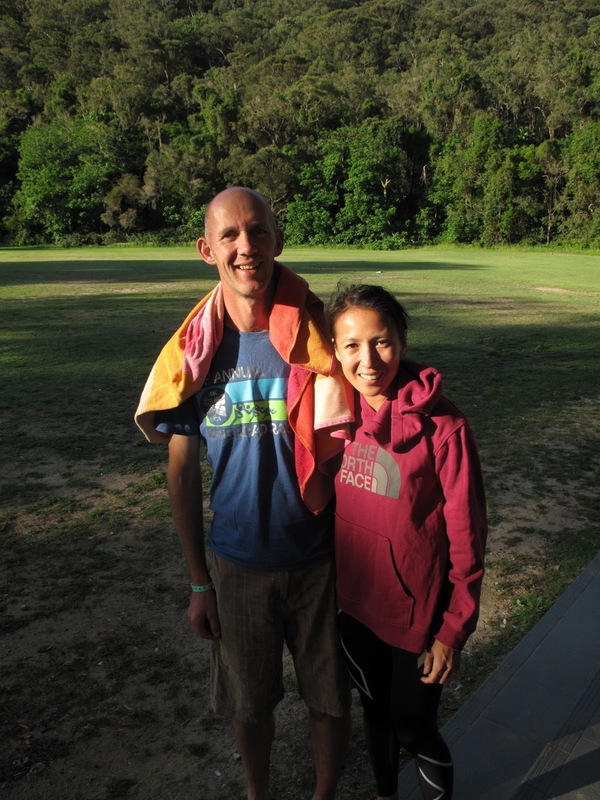 Luke was familiar with the course up to the 100km mark, having run it during training. Unfortunately I’d never seen the course and his detailed description was lost on me. The sentiment was very much appreciated though, Luke! Registration was at Tulkaba Park, and that morning there were mosquitoes everywhere! The pre-race briefing conducted was conducted by Dave Byrnes, the race director. He very kindly gave a mention to the handful of overseas competitors – a couple of guys from the Philippines, an American, and myself. The hospitality of the local runners was uplifting, and many came to say hello and to wish me luck. Everyone seemed to know everyone else and the GNW100s almost feels like you’re intruding on a family party, but one where you’re quickly made welcome. Nearly crashing into the photographer … trying to turn on the Garmin and not looking up! Then, without any fanfare, we were off. I didn’t actually hear the official start, and just started running when everyone else did. The pointy end of the field took off whilst I just tried to start off steady. Whilst trying to make sure I started my GPS I nearly collided with the photographer at the start. This was going to be a long day! 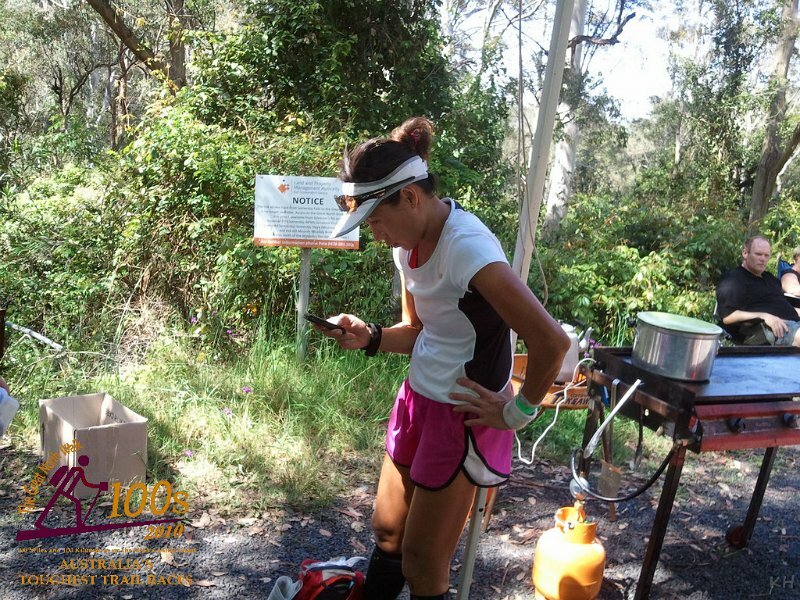 The first checkpoint was at 18 miles (28.6km), and it was hilly from the start. 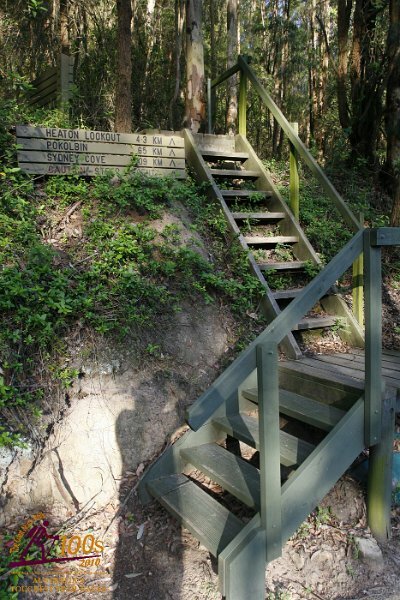 This first section took us through primeval rainforest, which was awe-inspiring and daunting at the same time. It felt like I was on the set of Jurassic Park … minus the dinosaurs. There were definitely sections that weren’t ‘runnable’ … even if you were Kilian Jornet! The route wasn’t very clear and I relied on the runners around me, including Luke, to take the lead. We had to keep a lookout for the occasional fluorescent orange paint spot that indicated we were on the right track. I’d never done anything like this before, and most of the time it barely looked like there was a trail there at all! We crossed a creek at about 15km where I very cleverly managed to lose my footing, and do a slippery slope slide down the side of the rock face straight into the creek! I thought I was going to break something given the height and speed from which I fell, but luckily nothing more than a few grazes, wet feet and covered in creek gunk. One of the runners helped me out and we were on our way again. My wet feet would give me some serious blisters later, but that couldn’t be helped. A quick prayer of thanks that my race wasn’t over so early on, and I squelched off again. Just after the first waterstop. Still smiling at 17km .. early days yet! 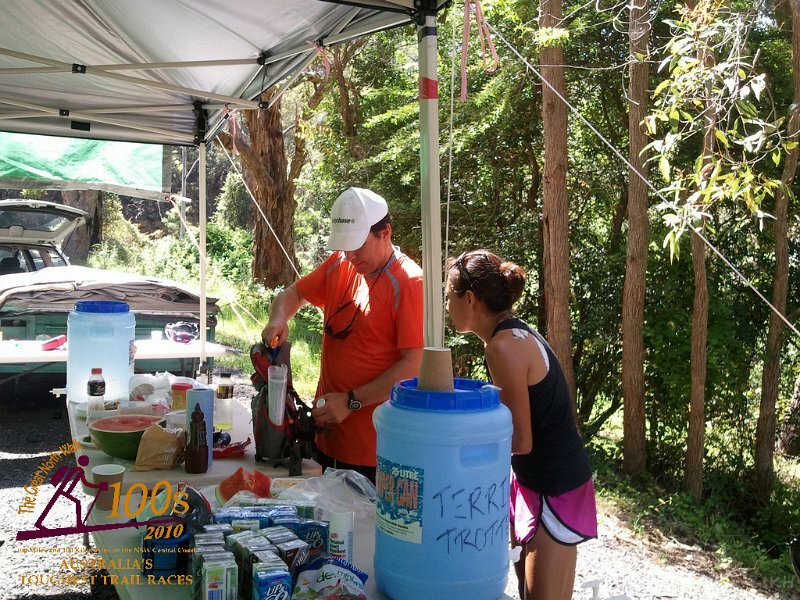 At 17kms I took advantage of the waterstop at the petrol kiosk to refill my pack and got a morale boost from the supporters waiting for their runners to come by. As I got closer to CP1, I thought it odd that I was feeling unusually sleepy, since it was daylight and I’d not been running for long. Then I remembered. I’d taken an anti-histamine the night before to help me get to sleep … it hadn’t worked last night because it was only taking effect now! Lesson learnt. On the bright side, at least my mozzie bites from this morning weren’t itching! Popped 50mg of caffeine to wake myself up and kept going. Coming into CP1 was a welcome pit stop. Luke’s dad and brother were part of his support crew and had already sent him on his way. They very kindly helped sluice off all the creek gunk I’d collected from my fall and made sure I had everything I needed for the next section. I kept fuelled on a concentrated mixture of Perpetuem, taking a swig from my flask every 30 minutes or so, and had some Clif Bloks and Powergels with me as well. Into CP1 .. creek gunk all over! Out of CP1 .. clean for now! CP1: 28.6km in 4:09h, and 9 minutes spent getting sorted! 15 miles (23.9km) to CP2. The weather so far was hot and humid, perfect for me, having come from the heat and humidity of Singapore, but I could see some of the other runners were struggling with the heat, particularly on the exposed sections of the course. I ran this leg alone for the most part, passing a few people and being passed by others in return. The open stretch of Congewai Road seems never-ending in the heat, and finally getting to CP2 is like finding an oasis in the desert. The event crew and runner support crews were all so friendly and helpful, doing as much as they can to make sure every runner is well looked after. I took my time to regroup, refill and reconsider. I’d started optimistically, thinking I might be able to produce a sub-30hr time. But with the first 40kms being pretty much uphill, I had to rethink my goals. There were far worse hills to come, none of which I’d seen before, and some sections so far had been slow-going due to difficult terrain. I’d been told to expect more of the same. 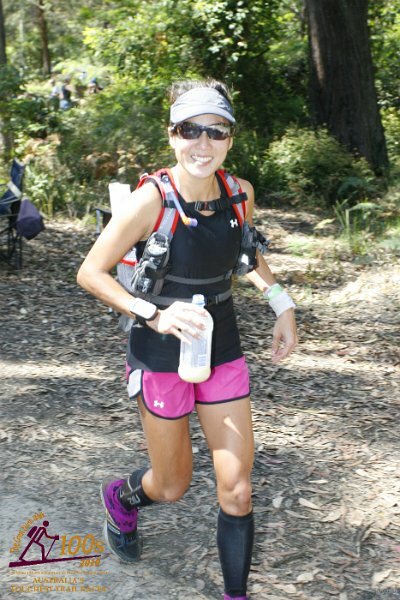 At CP2, I could see runners seeking refuge from the heat and trying to regroup before heading out again. There were 15 DNFs at CP2. Due to the heat, I’d put Perpetuem powder in a sports bottle at each CP. I’d mix it with water when I got into each CP, and refill my gel flask from there. So far, so good. We also had to have our night visibility equipment before we left CP2, and pass a mandatory equipment check before departing. CP2: 23.9km in 3:12h, and 16 minutes spent getting my act together! Coming out of CP2 it’s an uphill drag and a couple more peaks thrown in before descending into The Basin. I was running on my own for a bit, and had to really concentrate to make sure I was on the right path. The course maps weren’t much use to me, but the detailed instructions were extremely helpful. 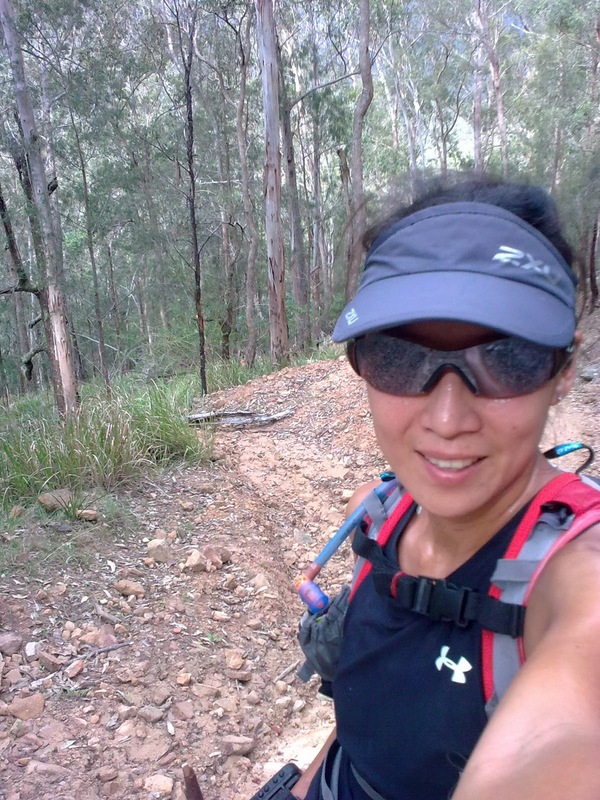 Having a GPS (Garmin Foretrex 301 – thanks, Kah Shin!) helped as I knew exactly when to look out for the next route marker. I ran with a chap named Ridler for a bit. He was using trekking poles to help him along and I wondered if I should have brought some too. I’d borrowed a pair to bring, but decided that my lack of practice with them would only serve to hinder me and so left them behind. I ran on after that and joined up with Geoff and Graham, who were to be my running companions for the majority of the course. We’d agreed to run together as it got dark for companionship and to make sure we didn’t go too far off course. 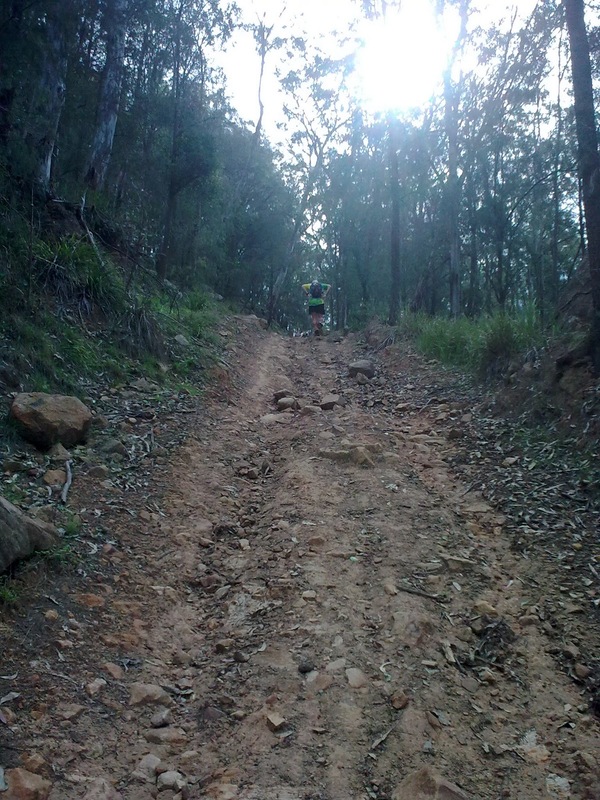 It got dark not long after we entered The Basin, and it was singletrack in more foresty conditions for the most part. It seemed to take forever to get to CP3, despite the fact that we were going downhill. The fading light made us more cautious and a couple of freshly fallen trees made our journey just a little more complicated. The lights of CP3 were a relief indeed, and we all sat down to hot soup, sausages and other welcome comforts. I’d developed some blisters at this point from my wet shoes and socks, and took them off to assess the damage. I’d also managed to pick up some leeches along the way, and they were wriggling away on my shoes and socks. All of us had our leeches dispatched by a cheery race steward brandishing salt and a pair of scissors. Apparently if salt doesn’t kill them, cutting them in half does! I didn’t have any spare socks till CP4 so there wasn’t much I could do about my blisters apart from grin and bear it! I’d also decided not to take any more Perpetuem and take on some solid food instead. I’d never trained with solid food but I was well and truly sick of the sweet taste and craved something salty and solid. I was worried about the effect that solid food would have on me as I’d been coping fine so far on my planned fuels. The sausage sandwich I had at CP3 was truly the best I’ve ever tasted, though! I had a bag of ready salted crisps and some vacuum packed bak kwa (barbecued pork) in my CP3 dropbag too … they tasted heavenly! Now it was properly dark and we all put on our hi-vis vests and headlamps for the next section. Up until now I’d been texting my sister in Singapore each time I got to a CP so she could update my status on Facebook. However, there was no mobile signal in The Basin. The texts I’d been receiving from friends and family so far were a great motivator, though! CP3: 29.1km in 5:55h, 28 minutes for leech removal and hot soup refills. Graham in front of me. Steep or what! The path goes down off the left of the pic. I reluctantly left CP3 with Geoff and Graham. The bright fireflies in the forest were a brief distraction, but then we were back to the grim reality of navigating the steep uphill section out of The Basin in the dark. I’m grateful to Geoff and Graham for their company .. I’d have fared a lot worse if I’d been running alone towards CP4, and definitely would’ve lost my way. By this time we’d already covered 80kms, and CP4 also doubled as the 100km finish. It was just after midnight when we got into CP4, and this was now the farthest I’d ever run – 103.7km. I was feeling tired, grumpy and not keen to carry on at all. My blisters had now become all consuming points of pain on my feet and I felt like I’d had enough. I was envious of the 100km finishers, they were done for the day. 72kms left to go! 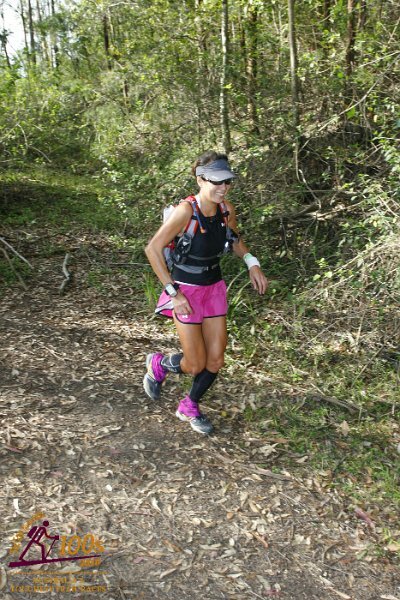 I had to rally my thoughts and focus on finishing .. the UTMB beckoned! The crew at CP4 were truly amazing, making sure we had everything we needed without even having to get up! Geoff’s support crew (the lovely Jocie and Zoe) even helped tape my blisters for me. Leech removal, followed by another fabulous sausage sandwich, crisps, coke and salted nuts, all of which boosted my morale a little more. Armed with a fresh pair of socks, I was finally ready to head out again. We had at least 5 hours of darkness left before the sun would start to come out. CP4: 22.1km in 3:56h, and 40 minutes of recuperation! It was definitely a hard slog out of CP4, and we were going uphill for the next 15kms or so. On the bright side, I was back in mobile reception once we got to the top, and the text messages that came flooding in once I had a signal were very gratefully received. I was taking caffeine every 90 minutes or so to keep myself awake, and popped a couple of salted plums for the same effect. I’d ditched the Perpetuem again and filled a spare Ziploc bag with salted nuts and dried fruit from CP4. I also had chafing issues for the first time, and had to cut the lining out of my shorts to reduce the friction. CP5 was at the top of another hill (no surprise there! ), and it was daylight by the time we got there. It was energizing to be running in daylight again, but by this time my feet were so sore I was desperate to get my blisters seen to. Graham and Geoff had gone on ahead whilst I lagged behind feeling a little sorry for myself. I was well and truly fed up with running, walking and being tired and in pain. I got into CP5 and gratefully sat down in the nearest chair. Someone got me some lovely cold coke, and Ross, the CP medic very kindly came and took a look at my feet. He dispatched a few leeches that’d come along for the ride, and lanced the main blister on the ball of my left foot, which was causing the most pain. Geoff had blister troubles of his own and was being tended to by his support crew. Jocie helped me duct tape my feet before I put my shoes and socks back on, and my feet felt a little less sore for that. Meanwhile, Graham looked fresh and ready to go after some refreshment. However, he very kindly waited till we were ready too. CP5: 28.2km in 5:50h, and 30 minutes spent tending my sore feet. The next bit was meant to be the ‘easiest’ and shortest section, but I certainly don’t agree with that! At first I tried keeping pace with Graham, but he’d definitely got his second wind and went storming ahead. I lost Geoff behind me as he was making slower progress due to how sore his feet were. Alone again, I really tried to rally myself and get some sort of a pace going, but it really was difficult. I’d underestimated how hard this event was going to be and I was now learning all my lessons the hard way. I’d completely lost my appetite by now and had to force myself to have a Clif Blok or some nuts every so often. This section was at my lowest point. Everything hurt, I was running alone and trying not to get lost, and I was just so tired! All I wanted to do was stop. I’d also been passed by Geoff, a lady called Susannah, and a chap named Symon. I wasn’t exactly having a great time. Then I got a text that said “Pain is temporary, quitting is forever.” Those words motivated me more than I thought possible. Since I was in pain anyway, what difference did it make if I walked or ran? At least if I ran I’d get to end a little quicker! So that was it. I picked up the pace and ran. Not fast by any stretch of the imagination, and certainly not pain-free, but at least I’d stopped feeling sorry for myself and got back to my original aim of completing my first 100 miler. I passed Geoff again just before CP6, and got there a few minutes before he did. Getting to CP6 felt encouraging .. just over 25kms to the finish .. how much harder could that be? CP6: 17.8km in 3:16h, and 28 minutes spent re-taping my feet and scoffing as many crisps as possible. Only 25km to go … how much worse can it get! Clean top and visor, trying to text home before the last leg. Whilst at CP6, Geoff told me that the last section was not to be taken lightly, and that it was quite exposed for the most part and hilly to boot. Taking his advice, I slathered on the sunscreen and made sure my hydration pack was topped up. I was glad I had a fresh top to change into, but should have put it at an earlier checkpoint! I left CP6 together with Geoff, at the same time as Horrie, an ultramarathon veteran, and his pacer Keith. I stayed with them for a minute and then decided to run on ahead. My feet had been freshly taped and felt a little tight, and I hoped running a little harder would loosen up the tape. My renewed enthusiasm lasted less than 30 minutes and I was slowed by the steep climbs and descents that had been characteristic of the course thus far. I’d even picked up a large stick to use as a trekking pole .. it certainly helped on the climbs and I now wished I’d brought some with me. The scenery thus far had been beautiful and breathtaking, but the terrain had also caused me more pain than I’d ever experienced in a race before! There were a few wet crossings, and the tape on my feet felt like it had started to come apart. 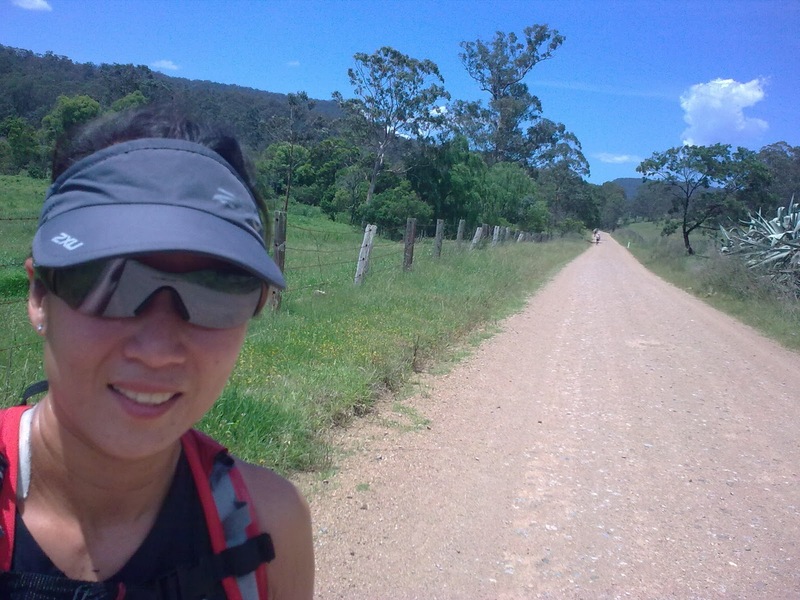 My feet felt like mincemeat, and by the time I got to the water-stop at 16km in, I’d slowed to a resigned walk. This was officially 100.4 miles (160.64km), and I’d let out a small yell of celebration at the passing of this milestone. Nonetheless, there was still just over 9 miles (15km) to go before the finish. I met a couple of runners (Kevin and Andrew?) at the unmanned water-stop, and Geoff, Horrie and Keith had also caught me up by then. I was grateful for the company and kept pace with them for the next 5km till we went up Mt. Wondabyne. Found out Keith is a fellow Singaporean now resident in Sydney, and gave him my last piece of bak kwa .. it’s hard to get that stuff anywhere outside of Singapore! It felt like really slow going to the top of Mt Wondabyne and I really wasn’t sure if I was going to make the 36-hour cut-off time. 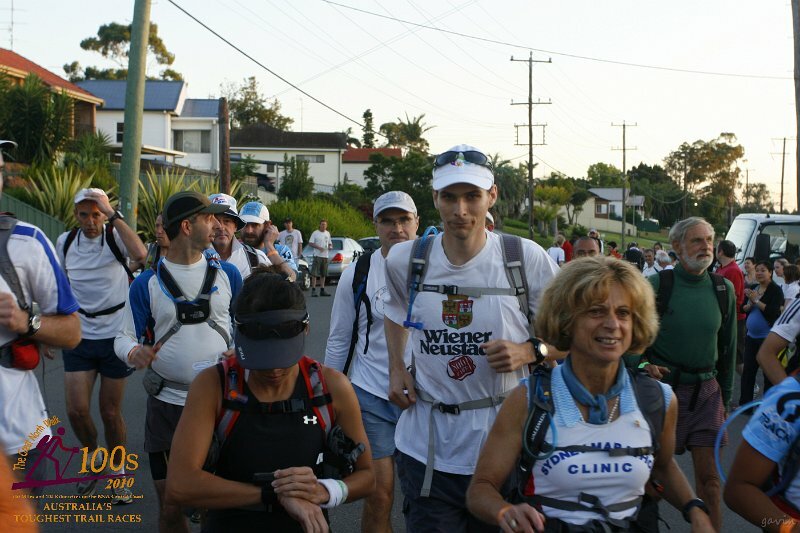 We were all tired and in pain (except Keith, who seemed to have more energy than a warren of Energiser bunnies), and I remember thinking that this had to be hardest 25km I’d ever done. Starting the descent from Mt Wondabyne, there was a sign that read ‘Patonga 10km’. That was it. I though about all the 10km races I’d run and surely it wouldn’t take me more than 90 minutes to get through this last 10k? So I ran. I really ran as hard as I could. I’d also ran past Kevin and Andrew who were further along, and I remember yelling, “Pain is temporary, sub-35 is forever!”. This certainly felt like a second wind. My pain didn’t miraculously disappear, but the sudden urgency I felt to finish this within 35 hours somehow managed to channel it to fuel my motivation to push hard. I’d had to reassess my goals all along the way. My initial plans for a sub-30 finish had gone up in smoke ages ago. Then it was sub-31, sub-32 and sub-33. Now I was aiming for a sub-35 and desperate to achieve at least that! I literally ran my heart out. I pushed so hard and got worried a couple of times when I thought I’d lost the trail. Trying to run fast and navigate at the same time isn’t easy! By the time I could see the beach, I was running like a crazy person. I was hurtling down the side of the cliff towards the beach, looking at my watch and trying not to break my neck at the same time. I remember saying a quick prayer for safety .. the last thing I wanted to do was fall and break something with 1km to go! I was really cutting it fine for a sub-35, and I had to dig so deep for the last few kms. When I finally reached the beach, I was momentarily confused about which way to go. I could see everyone in the distance waiting by the wharf, and the bell was ringing to signal a runner coming in. I picked the harder route along soft sand (my experience with the race so far indicated that would be the logical choice) and ran like my pants were on fire. My GPS timer was reading 34h 55min, but I couldn’t really be sure that was accurate, as I’d lost some distance along the course due to a poor signal. 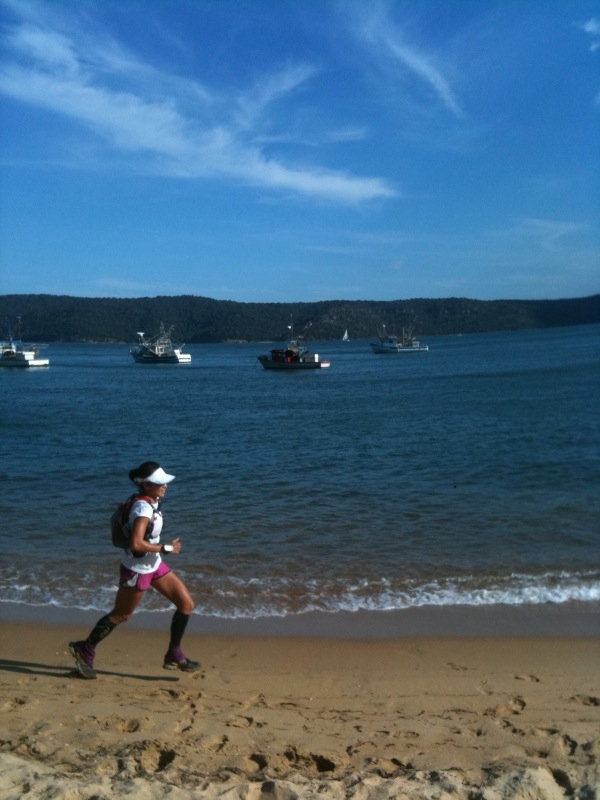 It really was the best feeling running along Patonga Beach, to the cheers of the small crowd of spectators. Reaching the finishing post at Patonga Wharf, giving it the traditional kiss, and receiving my finisher’s medal felt amazing..
Official finish time: 175.3km in 34h 59 mins. It’s true .. sub-35 IS forever! 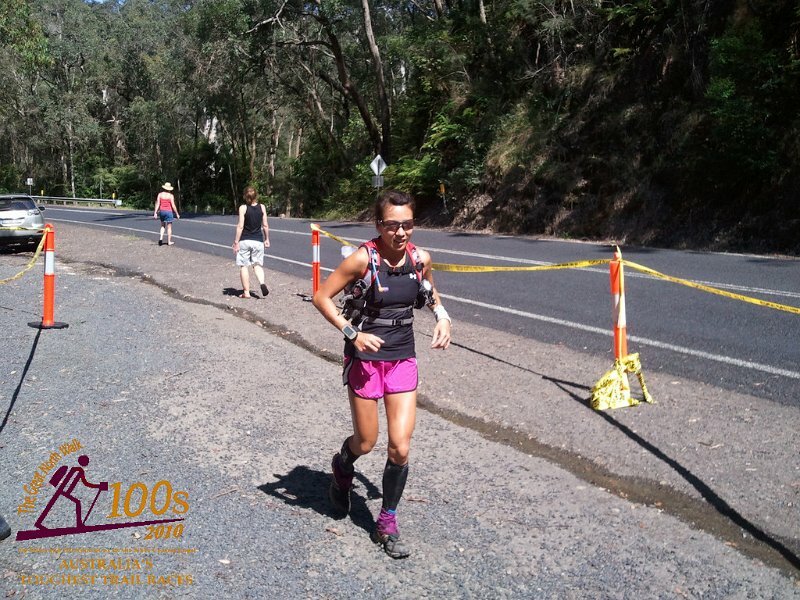 There were 29 DNFs in the 100 mile event, and 33 runners finished it. 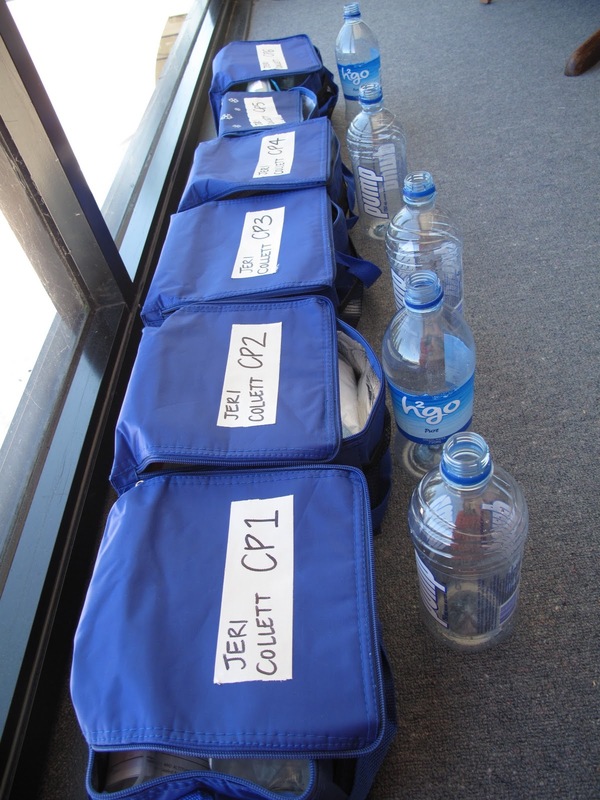 Even post-race, the event crew continue to make sure the runners are comfortable and looked after. There were freshly grilled bacon and egg sandwiches, endless coke and jelly babies, as well as mattresses on the verandah floor if you needed to crash out. Geoff and me at the end .. finished at last! What would I do different next time? (I’m definitely going to do this one again!) Socks and duct tape in each drop bag, not just at 100km. Clean clothes at halfway rather than 150km (obviously I didn’t think this one through!). Train with more real food – that’ll also reduce my pack weight. Sachets of salt for the leeches, a smaller mapcase, and shorts that don’t chafe after 125km …. oh, and a LOT more hill training! I taped my neck with zinc oxide tape in anticipation of chafing from my pack .. great idea till I had to remove it! I don’t know if there’s a better substitute .. vaseline and Body Glide don’t really work for me and tend to get a bit messy. Maybe kinesiotape? Carrying a small roll of tape always helps .. you never know what adjustments or last minute repairs are needed. I drank about 16 litres of water with Nuun electrolyte tablets along the way, exactly as I’d planned and I was well hydrated throughout the course. I also had about 300mg caffeine throughout the night – more than I’ve ever had, but with no detrimental effects. I took Hammer Nutrition Anti-Fatigue Capsules throughout the entire event, one dose each hour. Speaking of which, I think they worked very well .. my fatigue was more from a general weariness and sleep deprivation rather than lactic acid buildup. I didn’t eat as much as I thought I would, and probably consumed about 6000 calories in 35 hours. That left me about 10000 calories in deficit, which I happily rectified the following week! Perpetuem was handy for the first 60km or so, but a chore to mix and difficult to drink in hot weather. Clif Bloks and Powergels were a trusted staple, and sachets of peanut butter and bak kwa also helped boost my calorie intake. Next time I’d add more crisps, salted nuts and dried fruit to my rations. The Terrigal Trotters website on the GNW is very informative and RD Dave Byrnes is extremely helpful. 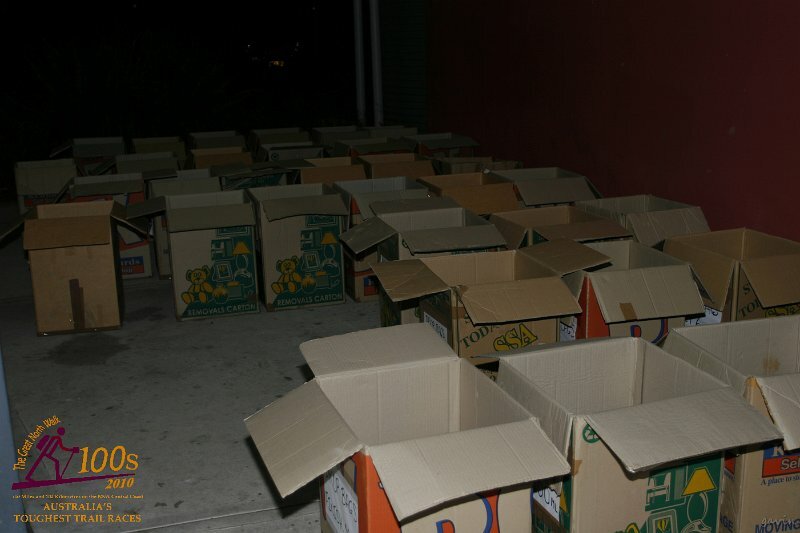 All the event crew, volunteers and support crew deserve a huge round of applause for their assistance and patience. I’ve never been at a race where I’ve felt so well looked after! And my grateful thanks to friends and family for their texts, calls and Facebook comments .. very much appreciated! I’d keep my mobile in a more accessible place next time as well .. there are moments I wish I’d had pictures of, but it was just too much hassle to get my phone out! Finally, huge thanks to SDPE International for the very generous sponsorship of Under Armour kit (super comfy and not bad looking either!) and fuelling supplies from the US, and to Winstech Engineering for their generous support too! This event was a real test of my physical and mental ability to push myself to the limit and beyond. I’ve learnt so much about myself, and it’s a journey I recommend to anyone. Your mental strength plays a huge part in an ultra, more so than I thought possible. It’s important to do some training alone for the psychological aspect, and to have an arsenal of motivating strategies to call on when you need a boost. 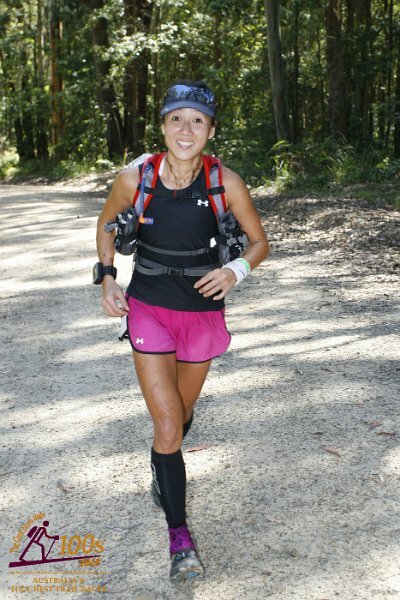 I hope this inspires some of the ultra-runners in Singapore to sign up .. the GNW 100s is an amazing experience. Now, onward to UTMB!